These days, they are making it hard to feel proud to be an Indian. This week was an exception. I am talking about the Tata Nano. I love manufacturing , there is something about creating a “thing” and having the world talk about it. 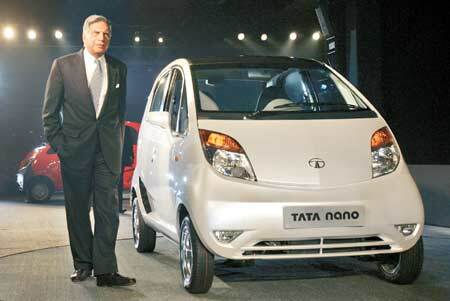 Way to go, Mr Ratan Tata ! I was watching TV the other night and one of the channels had on a certain Vivek Aggarwal. Turns out he is the collector of Indore MP. He was talking about public transport in the context of Tata Nano. I was impressed with his initiatives on public transport in Indore. I immediately went online and checked out the Indore public bus system. I have never been to Indore, but I think we have a winner for the best bus system in India !! Any Indore-ians who can comment on this public transit system ? I hope other cities can follow this example. I dont think folks prefer to sit in their Nanos in choking traffic, when an air conditioned public bus glides along a dedicated lane. Demand better public transport from your legislator. Of course, I am just kidding 🙂 First, support a system that squishes narrow group interests and enhances big picture issues such as public transport. Then your legislator will be forced to listen to you. « We are expire ! Indore city buses have earned praises from all around the nation. The same model is being accepted by many cities – Jaipur, Ahmedabad. Its already catching up with other cities of MP. Vivek Agrawal came out of the blue and did it all for Indore. We all love what he did. And these days bus stops are equipped with navigation system which tells you when the bus is going to reach the stop. Its state of the art. I may add here that Indore being a mid size city, not many residents have ever travelled in the new buses. I lived in Indore for 25 years, I know so many families, including mine, which do not need to use public transport for years and years. Even then we all love our city buses. And for most part we feel blessed that it has cut down on the killer Nagar Sewa buses. Looks like the mid-sized cities have a better chance of success with BRTS type schemes. The planned system for New Delhi has been widely panned. Mass transit systems also work for cities that are generally better planned from inception. Most Indian cities sort of mushroomed. They also suffer from extremely rapid population growth. Bus systems cost much less than underground trains. Yet they suffer from some of the same issues – lack of availability of space in which to build the lanes. Perhaps we will start seeing overhead monorails soon. Maybe a couple of well developed mid-size cities can take some load off the metros. Very interesting. Are they affordable ? Why would people not use it ? I think may other cities can take a cue out this initiative and start their own…. Yes they are very much affordable and very convenient. However, from my experience with Indore, I guess people(as in the ones having their personal vehicles) do not use the buses coz indore is still not as crowded as b’lore/delhi/mumbai/pune to make commuting in personal vehicles difficult. And it is always a status symbol for many of the people there to move around in their own cars/bikes etc. The city bus transport system was started as a pilot system in Indore city. Its was one of its own kind in the whole country. Their dedication can be guessed from the fact that on its very first day passengers were taken to their destinations free of cost. They were not charged even a single penny. Definitely it brought a revolution in the public transport system of Indore. After it omni vans replaced the tempos and also Maruti SX4 was brought as a city cab. There are some problems in the system as no entity can be error free. In some chaotic areas of city, buses cant go and even if they go create jams. So I think they have to work a little harder on the basic infrastructure like roads etc to fully integrate this service to a common man’s life of Indore city. Definitely this man (Vivek Agrawal) is a man with ideas. Hats off to this man.